When I was little, cellphones were huge and had really horrible battery life and coverage. Now it seems like even the most basic smart phone has more memory and a faster processor than my beloved first computer, a Quadra 605, did. It's especially amazing to me how much oomph they can pack into tablets these days. They truly are a portable computer and not just a stylish accessory– although the new mini-tablets are so cute, they could go either way. The Android platform is easy to navigate and I really like the dynamic tiles. It's very sci-fi. 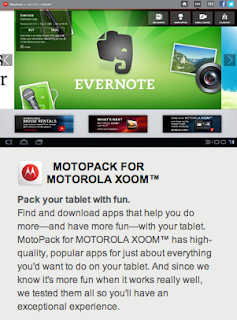 One thing that I found very compelling while researching the Xoom online was the MotoPack for Motorola Xoom, which contains a smorgasboard of pre-selected apps. 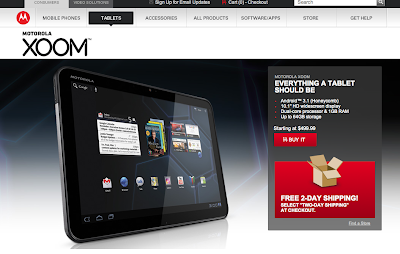 It's pre-loaded on the Motorola XOOM Family Edition. Having apps suggested really helps when you're new to the world of smart devices, especially if you're not particularly computer-savvy, either. I can't say that I was impressed with the service at the Sprint store I visited. Once they realized I was window-shopping and not likely to purchase anything, they totally ignored me. 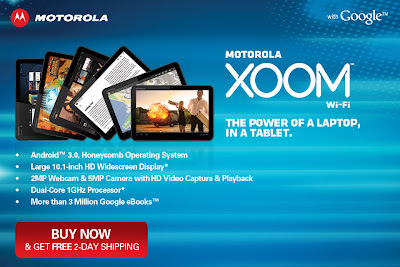 The Xoom floor model wouldn't turn on and I had to get a sales associate to plug it in because the battery had run out. The in-store retail price also started at $599– quite a bit higher than the current online “Buy Now; Get Free 2-day Shipping” deal which starts at $499 for the same model I looked at. Unsurprisingly, I would highly recommend the priceless you-don't-have-to-deal-with-surly-Sprint-clerks option. In accordance to the FTC Guidelines and the WOMMA Code of Ethics, I am disclosing that this shop has been compensated as part of a social shopper insights study for Collective Bias. All opinions are, as usual, strictly my own.